Comedian Patrick Kielty and model Jodie Kidd were among guests at Silverstone race circuit last week as Abarth launched the UK version of its hugely successful Trofeo 500 race series. The one-make series, featuring Abarth’s potent new 500 Assetto Corse race cars, has proved a remarkable success on the International race calendar following a superb 2009 season in Europe. 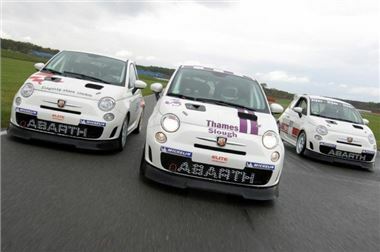 And now the UK series – called Trofeo Abarth 500 GB – has been officially announced, and will feature in top race meetings at some of Britain’s best-known circuits next year. Ivan Gibson, head of Abarth UK, and race driver Adam Jones, who won the UK round of the European Trofeo at Brands Hatch, Kent, this year, formally launched the programme to a large gathering of team owners, dealers, drivers and sponsors, who came to see and test the first six Assetto Corse cars delivered to the UK. Despite changeable weather, the test drivers managed to make the most of Silverstone’s small but demanding Stowe circuit to give the new cars a thorough shake-down. The 1368cc 16-valve turbocharged engine in the Trofeo 500 race cars develops 190bhp at 6500rpm and torque of 300Nm at 3000rpm to give the Assetto Corse – which weighs just 970kg – sparkling performance on the track. A smart body kit and 17-inch sports wheels add to the car’s impressive road holding and stability. A full calendar of race meetings featuring Trofeo Abarth 500 GB races will be announced soon.